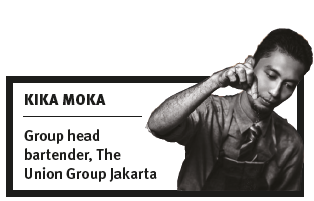 I started working behind the bar in Jakarta in 1997 in one of the best fine-dining restaurants with a 1950s American bar design. Some areas in Jakarta were very good with classic cocktails in hotel bars. Where I worked it was crowded with wealthy families and country ambassadors. Then came Hard Rock Cafe and Planet Hollywood with style cafes and super-duper cocktails whose ingredients could include 12-20 kinds of spirits and liqueurs mixed into one in a Hurricane Glass. Flairing became the trend of the Jakarta bar until 2003. From 2005 to 2008 concepts changed from American style pubs to super-club designs and wine lounges. Cocktails also changed to Martinis, Tutti Fruttis and Caipiroska, or fruit muddled with sugar and mixed with vodka or other spirits. From 2008 until now there has been a move towards the development of cocktails such as has occurred in America and Europe – clarified and sous vide –and those methods are used in Jakarta bars today. Usually the rules of courtesy mean that it is not polite to enjoy cocktails at an older age, but at the moment these rules are almost gone in the circle of Indonesian society. Pletok is a traditional Jakarta drink that is owned by the Betawi community and has a cocktail version created by Hamami Mamiek, one of Indonesia’s first bartenders in the 1960s, Wherever a bar opens in Indonesia there is always a Pletok cocktail both on the menu and at the cashier POS system bar. How advanced is cocktail culture in Jakarta? Jakarta has transformed in the past 10 years and there are now classic Japanese cocktail bars, private bars, speakeasies and some bars have rotary evaporators. Clarified, sous vide and re-distilled spirits are already familiar to us bartenders in Jakarta and this is supported by our frequent gathering and supporting the community of fellow bartenders. Support for each other is there and there are guest shift bartenders from outside helping it become a learning place for other bartenders. The Union Group Jakarta was the pioneer of the change in cocktail culture in Jakarta. After that Potato Head Family. When Dre Masso joined the group 10 years ago the cocktails in Jakarta were only Long Island, Illusion, Flaming and Lychee Martini but now Negroni, Bloody Mary, Manhattan, Old Fashioned and Sazerac cocktails can be found in almost all the top bars. Usually the top level bars are in the central and southern areas of Jakarta. Economic problems are not too bad for the Jakarta market because they do not really affect the income of the workers. Cocktail sales were still good until the last two years when they decreased due to political problems and a lack of clarity of spirit alcohol export/import regulations. The problem now is the unclear export/import alcohol rules because of political problems, too high taxes, uncertain stock and the expired alcohol tax. Hotels are only able to sell officially registered alcohol, while independent bars prefer items that arenot listed on custom because they are cheaper and varied. This is the main problem for the bar owner and bartenders in Jakarta and Indonesia. Who made you the best cocktail you’ve had in Jakarta? Hmm... Aditya Ananda from Arrack & Spiced, Yutaka San from The Classic Jakarta, and my staff.